I have two abiding memories of visiting Ferrassières, situated on a high plateau covered with lavender fields. The first memory was when my car broke down on a hot day in late June. All I could see was lavender, a sea of blue-purple. The nearest village was remote and miles away. Fortunately after taking in that breathless view, the car had time to cool down a bit and it started again. The second memory is captured in this painting. One evening, on my way back home after my yearly pilgrimage to the ‘lavender feast’, a feast for the senses, I noticed the deep blue fields contrasted beautifully with the golden sandy soil. The light was slowly falling on the brow of the hill, its line broken by two small trees that looked like shadow puppets against a large rising cumulus. The cloud shifted colour from pale yellow to deep gold and on the horizon, a peach glow made the two trees stand out even more. After the heat of the day, the lavender released more of its perfume. It floated and lingered a bit longer. It was quiet. Even the bees had had their fill and were gone. Imperceptibly, the light was falling and dying. The colour was draining away. I lowered my eyes and noticed all the vibrant colours of lavender had taken on a dull muted blue-grey coat. The night was closing in. I’d love to read your comment about this painting. Your descriptions, John, are so often as evocative as your images. I can remember observing, alone, as the light withdrew from the landscape and the colors faded, moment to moment, toward grey, then black. The palette and composition conjure somehow both vivid drama and a kind of sublime serenity — no small achievement. The scene feels surreal, a holy, heightened version of reality, filtered through memory and emotion. The gold shimmers against the complementary violets and blues. The cultivated rows lead off into the unknown, and the two trees stand like sentinels on the horizon — or maybe just observers of the sunset (not unlike the two tiny figures in “The Communion”). They really anchor the painting for me, visually and emotionally. Beautiful work, John. 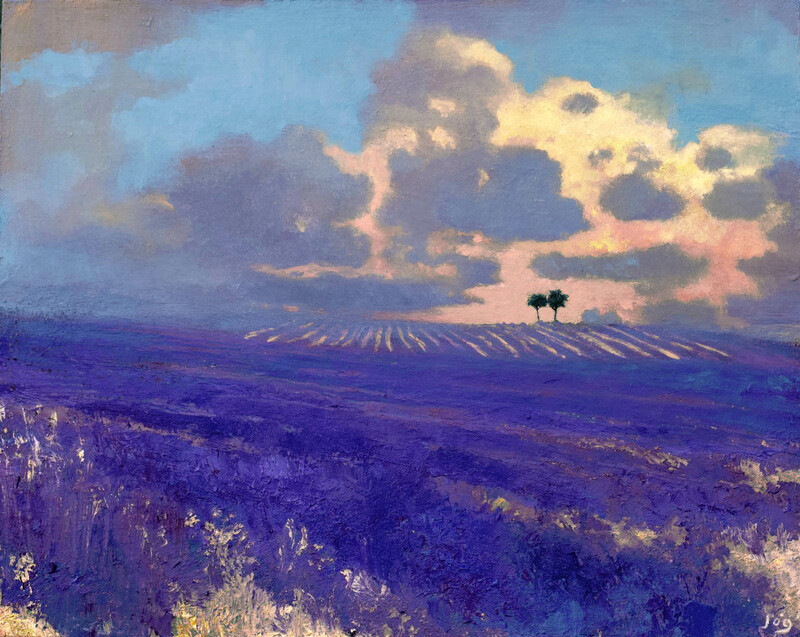 This is a painting that envelopes the viewer, suffused as it is with colour and the evocation of the scent of lavender. It has a lovely balanced composition with the trees drawing the eye to the exquisite light in the sky. I was struck by the contrast of the violets and the golden sandy soil and the residual shimmering heat of the day and all created with a limited but wondrous palette. Glad to hear that you picked up on the sand soil contrasting with the violets, in reality the soil and lavender are really like that and makes an wondrous glowing sight of colour. It was also good to hear that you felt the trees drawing the eye through to the brow of the hill. Thank you for your thoughtful comment.